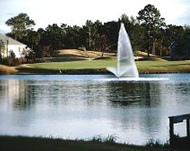 An affordable 18-hole golf resort located just minutes south of sunny Wilmington, North Carolina, Beau Rivage includes 25 condo units inspired by the plantation architecture of the Deep South. The resort offers a snack bar, lounge, golf shop, formal and banquet dining (seating up to 250 guests). The banquet dining feature is popular for weddings (where the entire wedding party can stay at the resort), corporate retreats and family reunions. They also offer packages that includes two nights stay, three rounds of golf with cart and two breakfasts.